This month’s post from the Flowers In Pots series is all about hostas and planting them in pots is ideal as you’ll find out later in this post. Herbaceous – A plant that has leaves and stems that die down at the end of the growing season to the soil level. Perennial – A plant that lives for more than two years. They’re a very popular plant variety with a wide range of leaf colours, sizes and shapes and tend to look their best this month after their new leaves have unfurled fully, but before they’ve time to be jaded by the summer heat. Hostas flower in the summer and the individual flowers are either white, lavender or violet in colour, as shown in the images above. So what are the advantages of planting hostas in pots? If you’re familiar with hostas, I’m sure you’ll know that they are nectar to slugs and snails – turn your back and the next thing you’ll know is that the luscious foliage has been turned into something that closely resembles a doily! Planting hostas in pots will enable you to really make the most of the wonderful arching foliage. If you have a corner on your terrace where the paving meets a house wall, a hosta in a pot could be just the ticket to soften the whole look. For large areas of paving, try placing your hosta with other planted pots – a cluster of different sized pots will give any space more dimension. When you’re choosing the pot, think about how large the hosta will grow. 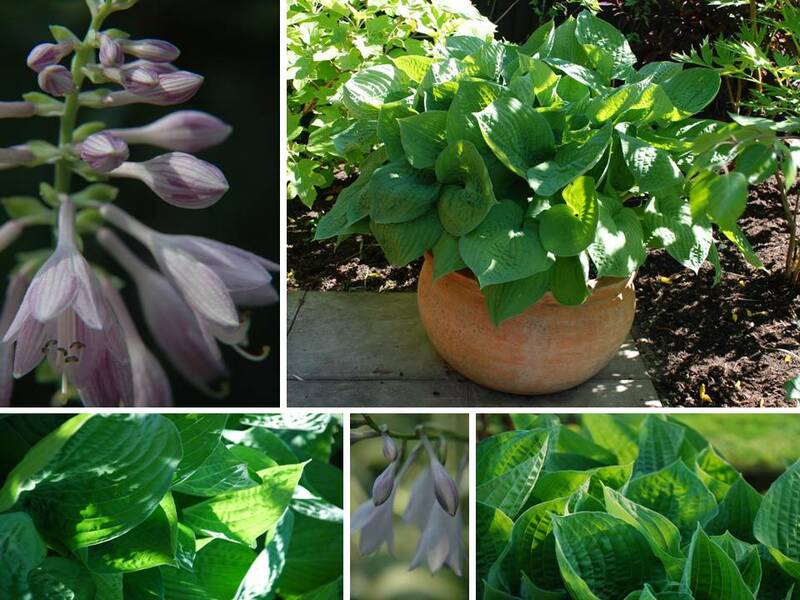 The ultimate size will depend on the variety of hosta you choose but you want the foliage to come over the edge of the pot as it does in the main picture above. Hostas are shade-loving plants, therefore if you have a very dark and dingy corner, you might want to use a cream variegated form to lighten up the space and give some added texture. So, if you’ve been having problems with your hosta plant being eaten by slugs and snails, why not transfer it to a pot? Yes, after what I went through with the slug situation this summer — container pots it will be for now on. I will have a collection of pots set up by next spring. I will just have to start the process all over. The slugs won…this time….and the last time! Hasta la vista slugs! Hi Cheryle, Yes planting them in pots does help although this year the slugs and snails have been especially bad….managed to savage my large hosta in a pot when I was away one weekend….too close to the flowerbed, I think they must have crawled up another plant to get there! Planting a hostas in pots its a very good idea and hostas looking nice. I have a lot of pots in my garden. Yes, much easier to keep the slugs and snails at bay that way!